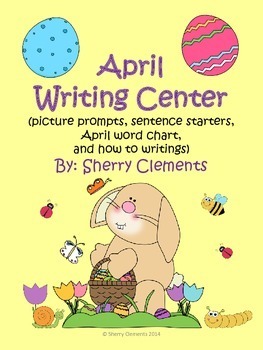 You can grab this cute Writing Center Packet for April HERE! 8 pages – There is a black and white picture prompt at the top of each page and lines on the lower half of paper for writing about the picture. Pictures included are April related such as basket of eggs, eggs in grass, boy with net and butterflies, boy in rain with umbrella, bunny with basket (2), chick with basket hunting eggs, and chick hatching. All pictures are black and white to allow students to color after writing about the picture. 3 pages – Three black and white pictures with words are included on each page. After each picture, there are two blank lines for students to write a sentence for each picture. Page 1 has egg, basket, and bunny; page 2 has rain, chick, and flowers; page 3 has bee, ladybug, and butterfly. 1 page – This April words chart has nine color pictures with matching words under each picture. The nine pictures/words are butterfly, basket, bunny, chick, egg, jelly beans, bee, flowers, and ladybug. Laminate and put in your writing center for students to refer to when writing. Writing pages can also be sent home for homework allowing parents to see their child’s stage of writing. I hope your students enjoy writing about each picture included and develop a love for writing.